You are at:Home»Learn & Live the Faith»Apologetics»You Should Be Worried! When St. Paul began traveling throughout the Roman Empire, truly going into the culture of death in order to proclaim the Gospel of Life, he encountered persecution, physical harm, threats of death, and ultimately the crown of martyrdom. St. Paul is not the only person to encounter resistance and threats of bodily harm as a response to the preaching of the Gospel to a world that does not want to hear it. Christians in every generation, in every age, in every country have faced similar persecution and even death for proclaiming the Gospel, for speaking the truth about life, and bringing Jesus Christ to the people of this world. The cruel irony of history is that this persecution often happened at the hands of those civilizations that claimed the mantle of being the most advanced, the most enlightened, the most civilized in this world. It began in the Roman Empire; it resurfaced in England, Germany, and Switzerland during the protestant reformation. It came about again in France during the Enlightenment, and Spain, Mexico, Germany, and Russia in the 20th Century. Far from extinguishing the flame of faith, these persecutions proved to be the seedbed for a new and profound evangelization. The Gospel is proclaimed even if its messengers are killed or silenced. Jesus says in the parable today, “I am the true vine, and my Father is the vine grower. He takes away every branch in me that does not bear fruit, and every one that does he prunes so that it bears more fruit.”(John 15:1, NAB). The pruning of the vineyard is truly measured by the blood of martyrs and the suffering of Christians at the hands of those who wish to silence the Gospel message. Yet, desiring to break the cycle of religious persecution and martyrdom among people of all faiths, not just Christianity, the founders of our country sought to create a nation that respected the rights and consciences of her citizens. To do this they sought to secure the right to life, liberty, and the pursuit of happiness, the right of free assembly, freedom of speech, and most radically, the protection of her citizens to freely practice their religion. So firm was their conviction in this, so pure their motives, that the founding fathers of our nation voluntarily pledged their lives, their fortunes, and their sacred honor to advance this cause, purchasing this vision for future generations with their own blood so we would not have to endure the persecutions that tore through the fabric of Europe. For over the course of two centuries now, the vision of our founding fathers has taken firm root in this nation. Christianity has flourished, people of other faiths have flourished, and our nation has been a safe haven and a beacon of hope for people around the world who are persecuted for their beliefs. The result of this is that our nation has been strengthened by the virtues and morals that flow naturally from religious belief. Even the Papacy, while initially suspicious of the novel idea of religious liberty advanced by our founding fathers, has come to embrace and advance the conviction that religious liberty is a basic human right – common to all humanity and necessary for human flourishing. No person should have to suffer death, bodily harm, fear, or any negative consequence whatsoever because he or she chooses to live and proclaim his or her faith, most especially in this nation. The Pope is worried, the bishops are worried, I am worried, and you should be worried. Today, we increasingly find that our voice as American citizens, as Catholic citizens, is marginalized and mocked; we find our freedom of conscience forcibly taken from us in the name of some greater good. Let me be very clear – there are no greater goods than freedom of conscience, freedom of religion, and freedom of speech – if these rights are denied us then all other rights can be taken from us as well. How can we be silent when states (Alabama) tell Christians that it is a crime for us to put into practice the demands of the Gospel by meeting the basic needs of illegal immigrants who come to us seeking food, clothing, and shelter? How can we be silent when cities (New York City) evict Protestant churches from places they have rented for years in acts of blatant discrimination? How can we be silent when Catholic Charities is told they can no longer facilitate adoptions and foster care in several cities and states (Boston, San Francisco, Washington, D.C., Illinois) because city and state leaders find it offensive that we believe that the healthiest home that a child can be placed in has a father and a mother united in the life-long, exclusive relationship of marriage? How can we be silent when the federal government tells our Lutheran brothers and sisters who can and who cannot be the pastor of their churches, a move thankfully struck down unanimously by the Supreme Court (Hosanna-Tabor Evangelical Lutheran Church and School v. U.S. Equal Employment Opportunity Commission)? How can we be silent when the department of Health and Human Services hands down an edict dictating that we as Catholics pay for abortion, sterilization, and contraception? And how can we remain silent when they announce to the media that they have made a “compromise” with the Catholic Church without even speaking to the bishops? That is no compromise. That is a lie. How can we be silent when our great work to end human trafficking, done for decades in partnership with the federal government, is shut down by this government because forcing the Catholic Church to embrace abortion is more important to them than helping the innocent victims of this trafficking? Whether we be Protestant, Catholic, Muslim, or Jews, whether we vote Democrat, Republican, or Independent, whether or not we agree with the pope and bishops, how can anyone remain silent when our very right, when our ability to live and proclaim our faith, or any faith for that matter, is being taken away from us, in a new crusade against religious liberty now being spearheaded by the federal government, the same government whose officers swear to defend our constitutional rights upon taking the offices entrusted to them? Quite simply–we cannot. We are Catholics. We are Americans. We have a right to speak out in the defense of our ability to live our faith. Not only do we have the right to do this, there is a grave need to exercise this right before it is taken from us. 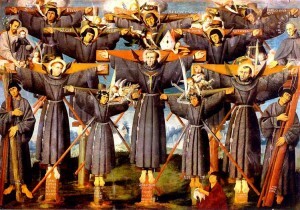 The blood of the Christian martyrs who safeguarded the faith by their death demands that speak out in defense of religious liberty. The blood of the men and women, which was shed in our War of Independence, shed so that we could enjoy the God-given rights this nation was founded upon, demands that we speak out to protect the rights of all. Our flesh and blood, our children and grandchildren, demand that we speak out, so that future generations may never know the face of religious persecution. This article was originally given as a homily on the 5th Sunday of Easter, May 6, 2012, at St. John the Baptist Catholic Church in New Brighton, MN. An excellent article and homily! Thanks for the astute article, Father. BTW, the Bishop’s statement appears also in the current issue of Columbia Magazine, the monthly from the Knights of Columbus. In addition, the issue has a series of articles on the Cristero Rebellion in Mexico during the 1920s — highly pertinent in that religious freedom was suppressed by the Mexican government, particularly targeting Catholics. In general, a good article. But, the Catholic Church entered into an un-holy alliance with the Democrat party and argued for bigger state programs. When the Catholic Church fails to take proper church discipline against Catholic politicians who support abortion – then the church is loosing focus on what is important. Our founding fathers had it right – a MINIMAL Federal Government, and let the States and charitable organizations take care of the poor, infirm, etc. Yet the Catholic Church has been in the fore-front, arguing for bigger federal government and more and more programs to “help the poor” rather than the Church doing that work. I suspect the Church would be okay with “ObamaCare” if Obama kept his promise about abortion not being funded…. So I would ask the question if the Church would be willing to see the Federal government shrink, so that it is less oppressive – or does it merely wish to work with “Ceasar” and make compromises that keep each somewhat satisfied?